The Hammir Wildlife Resort is ideally situated in Ranthambore National Park and hardly 4 km from the park entrance gate and approx 5 km from the Sawai Madhopur railway station. 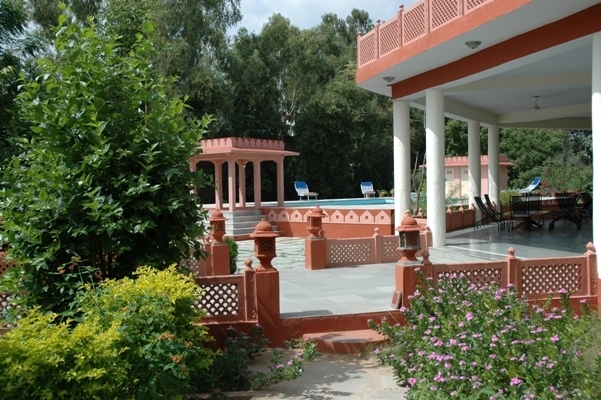 The Resort name came from the Hindu ruler " Hammir Dev Chauhan " of Ranthambore, Rajasthan. There is a sprawling lawn in front of hotel and back side of lobby where all rooms and cottages are located. The lawn is ideal place for enjoy of tea or coffee after hectic trip into the national park and you can enjoy with other in-house activities of resort. The Hammir resort offers excellent service with ultra-modern facilities and friendly staff. The resort has huge terraces which offer a view of Aravali hills and scenic ambiance of Ranthambore. The Hammir Wildlife Resort offers comfortable, well furnished, nicely decorated, clean rooms and cottages. The resort provide an option between air-conditioned and air-cooled rooms, you can choose accommodation as per your choice. The resort provide blend of eastern hospitality and equipped with modern amenities includes spacious neat and clean room, attached bathroom with running hot and cold water and room service. Each room has traditional Rajasthani ambiance and rustic décor which is allure of the guests. The Hammir wildlife Resort has dining hall with multi-cuisine restaurant that offers delicious food according to your test and satisfaction. If you wish to have your dine in privacy then resort offer room service. In the evening, you can enjoy with Rajasthani culture programmes.